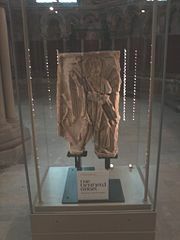 5.1 Modern uses of the term "Mercia"
After the murder of Æthelbald by one of his bodyguards in 757, a civil war broke out which concluded with the victory of Offa, a descendant of Pybba. 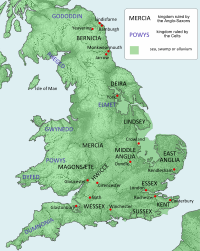 Offa (reigned 757 to 796) had to build anew the hegemony which his predecessor had exercised over the southern English, and he did this so successfully that he became the greatest king Mercia had ever known. 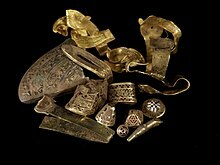 Not only did he win battles and dominate Southern England, but also he took an active hand in administering the affairs of his kingdom, founding market towns and overseeing the first major issues of gold coins in Britain; he assumed a role in the administration of the Catholic Church in England (sponsoring the short-lived archbishopric of Lichfield, 787 to 799), and even negotiated with Charlemagne as an equal. 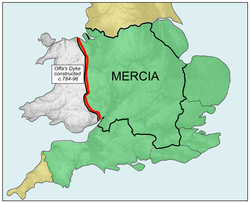 Offa is cred with the construction of Offa's Dyke, which marked the border between Wales and Mercia. ^ Roach & Hartman, eds. (1997) English Pronouncing Dictionary, 15th ion. (Cambridge University Press). p. 316; see also J.C. Wells, Longman Pronunciation Dictionary and Upton et al., Oxford Dictionary of Pronunciation for Current English.